A TOWNSVILLE flood victim stuck in Rockhampton was forced to endure an excruciating wait for medical assistance after being caught up in an apparent 'ramping' situation. Her concerned family members have voiced concerns of a shortage of resources in the public health system, leading to the issue 'ramping', where ambulances are held at hospital providing ongoing care to patients whilst the hospital staff try to cope with the workload and find space to admit the patient into the hospital. Suffering severe abdominal pain and vomiting, Pam Andrew, 67, asked her daughter to call her an ambulance at just before 10pm on Thursday night. The operator said there was a "high demand”, that they were "very busy”, with a "very high workload” before adding that "the ambulances were all at the hospital, and we're trying to get them released”. According to Queensland Ambulance Service public performance indicators for CQ in 2018, they had response times less than 30 minutes, 91.3 percent of the time and less than 60 minutes, 98.1 per cent of the time. With no sign of an ambulance after half an hour and the pain intensifying, Ms Andrew's daughter called again. The operator advised that her case had been escalated up the queue and if it got any worse to call them back. 40 minutes from the initial phone call, a single paramedic to arrived in a car to begin assisting Ms Andrew. It took almost 50 minutes for a paramedic crew to arrive with the ambulance officers confirming that ramping was currently occurring at the Rockhampton hospital. Ms Andrew departed in the ambulance for the hospital 80 minutes after the initial phone call and lay on a stretcher (with three other patients) in the hospital hallway for 30 minutes before being allocated a bed before finally being examined by a doctor after three hours. Her time spent on a stretcher in the hallway was in line with Rockhampton Hospital statistics listed on the Queensland Health website stating that 84 per cent of patients were transferred off-stretcher within 30 minutes. Ms Andrew had nothing but praise for the medical care she received throughout her health ordeal saying that all care staff had treated her with compassion and respect, but her family members questioned the adequacy of the public health system which had left her in extreme pain for an extended period of time due to the ambulances being stuck at the hospital. 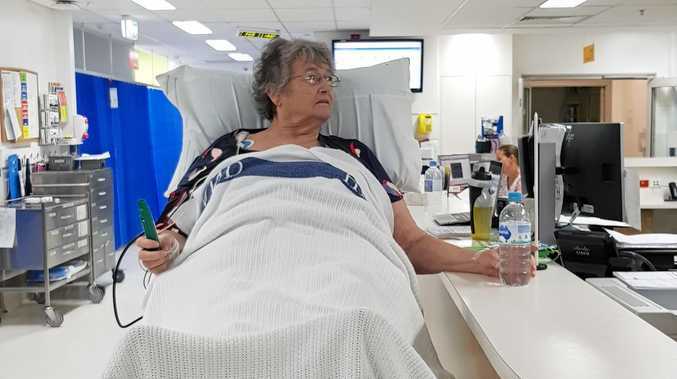 Executive Director Rockhampton Hospital Wendy Hoey said emergency presentations are not planned and there were occasionally very busy periods which could cause delays for patients, particularly those with less critical conditions. "Though only an average number of 131 patients were seen in the emergency department (on Thursday), 41, or almost a third of those patients, were admitted to hospital,” Ms Hoey said. "There was a particularly busy period with 44 presentations - or a third of all presentations for the day, arriving in the four hours to 7pm. She said this influx of patients and their complex conditions caused delays into the night. "Our great staff are dedicated to providing great care to patients throughout the hospital and they did a fantastic job during what was a very busy period last night,” she said. Ms Hoey sad the Rockhampton Hospital Emergency Department ranks as one of the top performing facilities amongst its peer group in Queensland for both patient of stretcher time and the amount of time spent in the department with, the median waiting time to treatment averaging 13 minutes in December.